So all our putative DMAP1 mutants are stably balanced (if lethal) and floating balancers (if viable – the balancer chromo is still in the stock but homozygotes abound). At this point, it becomes possible to purify genomic DNA from them and see how much we can find out about the molecular nature of any lesions in the region using PCR (I make the bold assumption all readers know how PCR works. If not, try this). First of all, we need to generate a map of the region, and design primer pairs that are likely to be diagnostic of any changes in the DNA. One very important primer will anneal to the inverted repeat of the engineered transposable element that we used as a starting point for our male recombination scheme. There are two primers of use here: P-OUT which anneals to the 31 base pair inverted repeat sequence in such a way as to point OUT of the P element (3′ end of primer directed away from the internal P element sequence) and P-IN, simply the complement of P-OUT and of course, pointing INTO the P element. By “pointing” into or out of, I mean, of course, that the Taq polymerase will extend from the 3′ end of the primer into or out of the P element. So here is a map of the primers I’ve designed so far. Recall that the original engineered P element is inserted into the 5′ UTR of the upstream (on the left) gene CG33785/6 (UTR = untranslated region – grey in the Flybase gene diagram above). The male recombination scheme is designed to select for events in which the P element partially excises from this location, taking with it material in the direction of DMAP1 – we want to leave the upstream region intact. If all goes according to plan, a successful event will retain the upstream (5′) portion of the P element, but should lose the downstream (3′) end, plus hopefully a nice chunk of the DMAP1 gene and nothing else. How MUCH DMAP1 DNA downstream of the P element is retained should be possible to determine by seeing if the downstream priming sites are retained. Of course the best way to do this is to carry out a Southern analysis. Cut up the DNA with a well-chosen restriction enzyme (well-chosen based on the sequence we know), fractionate the digest in a gel by electrophoresis, blot the pattern of fragments onto a membrane, incubate the membrane with a DMAP1 cDNA probe, labelled in some way to make it possible to visualize (usually radioactivity) and analyse the pattern of bands. Southerns are still important experiments – you see them commonly described in four point font in the materials and methods section of knock-out mouse studies. But they are not simple experiments, and they are not cheap, so PCR it is for us at SmallScienceWorks. 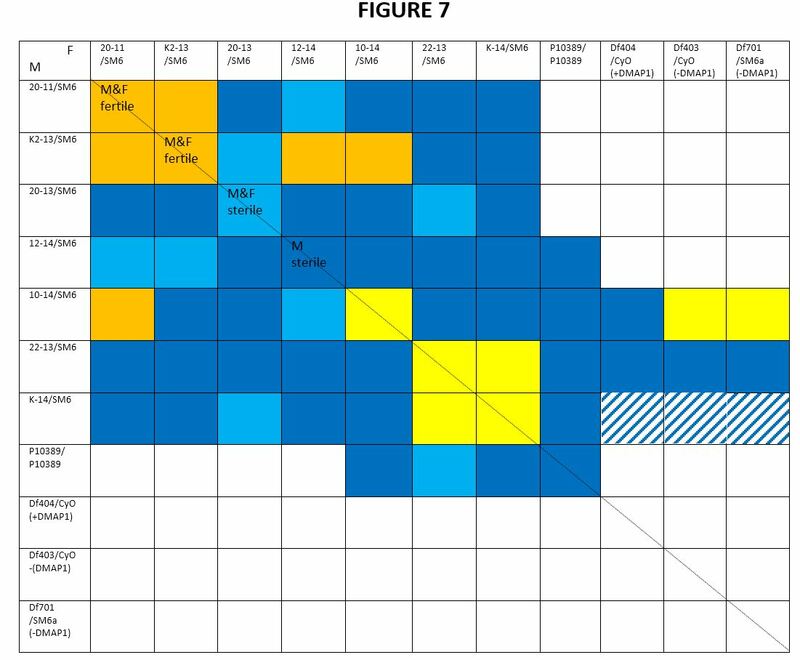 In Figure 1, top row of lanes, we tested all the viable isolates and w (which has no P element and is wild type for the region) using gene specific primers in DMAP1. 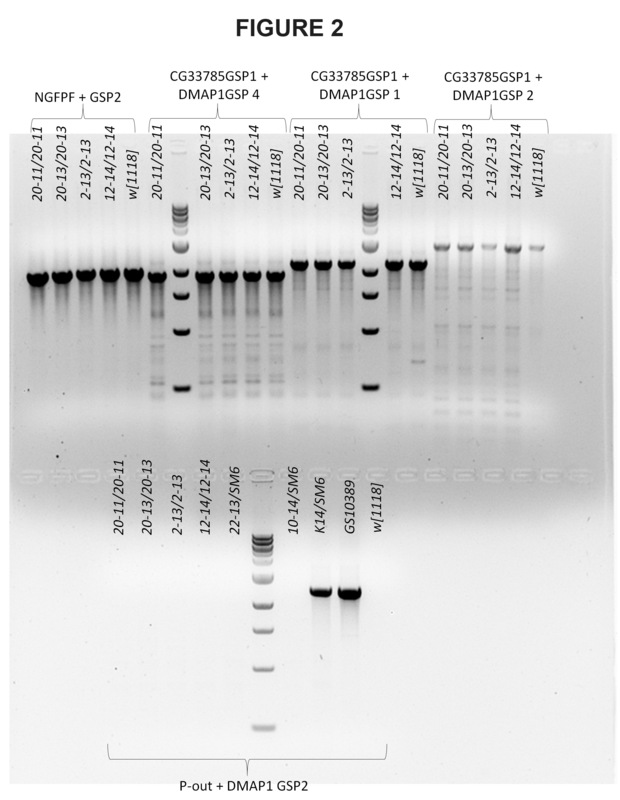 The bottom row, on the other hand, tests for the presence of the DOWNSTREAM (or 3′) end of the P element in all the isolates, by using P-OUT together with a series of DMAP1 gene specific primers. From these data, top row, which tests for gene structure in the mutants that are viable (as homozygotes) you can see that there appears to be no disruption in the region covered by all these primers (which is pretty much the whole gene). The band sizes for the mutants are indistinguishable from w, which is wild type (the gel is frowning a bit – the bands are distorted on the edges – not a big deal). Were we disappointed? Yes. NO! Of course not! We are dispassionate scientists, who want what we get, not get what we want. Buggah. From the data on the bottom row though, you can see that the P element is absent in all mutants EXCEPT K14, and of course in still present in GS10389, the original P stock used in the male recombination scheme (and therefore serving as a positive control). You may note some laddering in the bottom row, right hand side. That’s OK, that is non specific product, resulting from some weak false priming of the primers that shows up after 30 cycles. The data shown in Figure 2 are even more disturbing, at least the top row is. The NGFPF primer is a forward primer that anneals to the very beginning of DMAP1, starting at the ATG. The subsequent lanes are testing for amplification across the P element insertion site. CG33785 is upstream of DMAP1 – remember the P element is inserted into the 5′ UTR of this gene. The bottom row is another test for the downstream or 3′ portion of the P element. So the data in this gel tell us that the gene structure is probably completely unaltered in the homozygous “mutants” – I use inverted commas because they are scarcely looking like mutants at all. Any lesions, if they exist, must be so small there is no difference in band size when the “mutants” are compared with w, which remember, is wild type for this region. Hmm. The bottom row tells us what we already know. The downstream portion of the P element is absent in all mutants except K14. Perhaps, in the homozygotes, we had a perfect excision of the P element, plus a recombination event further down the chromosome, to put the brown eye color mutant onto the same chromosome. Who knows. 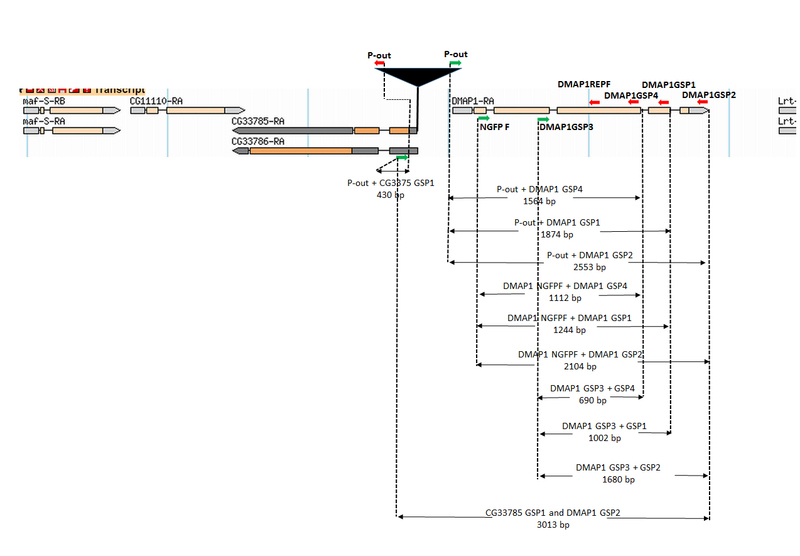 So what about the P element upstream of DMAP1? According to the scheme, the 5′ portion of the P element should still be there, though this is hard to believe with the homozygotes (top row Figure 2) – PCR across the insertion site shows no size difference with w. But of course, we did the PCR to prove it to ourselves. Here it is, Figure 3. So all peculiarities solved, right? Everything makes perfect sense, the end. Alas no. 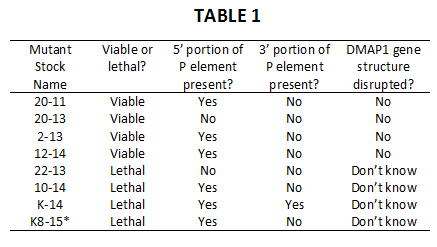 According to the top row of data, the upstream portion of the P element is present, (as it should be in theory) EXCEPT for 20-13 homozygotes, and 22-13/SM6a heterozygotes. Great. There is a little bit of false priming in the negative lanes but the upshot is, for three out of four homozygous viable “mutants”, the upstream or 5′ portion of the P element is there, and yet, not there, when PCR across the site is performed. The P element is there and not there. How very Heisenberg. Huh? I didn’t get all that. And I wrote it. For the mutants that are homozygous viable, the upstream portion of the P element is present (except in 20-13). The smallest amount of P element that could be left is 31 bp – the annealing site of the P-OUT primer. Unlikely – if the priming site is there, a chunk of the P element must be there. So when you do PCR using primers on either side of that chunk, then the band should be BIGGER than it is in w which doesn’t have the P element. BUT all the bands representing PCRs across the site are identical in size to the w stock. BUT the upstream P element is still there. 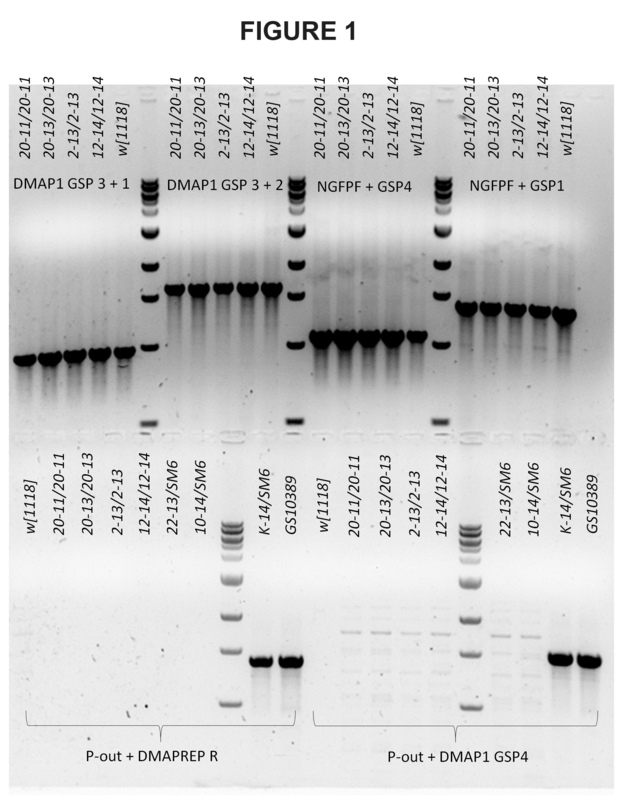 According to the PCR with P-OUT and the upstream gene CG33785/6. So for these homozygous viable mutants, the P element is there, but not there. See? It is a headache inducing contradiction. But there must be a solution, because this is real matter, this is Nature, this is real DNA. We just have to figure it out. Note K8-15* – this is a new mutant, generated by my colleague Kathleen Fitzpatrick this year up at Simon Fraser University in BC Canada. 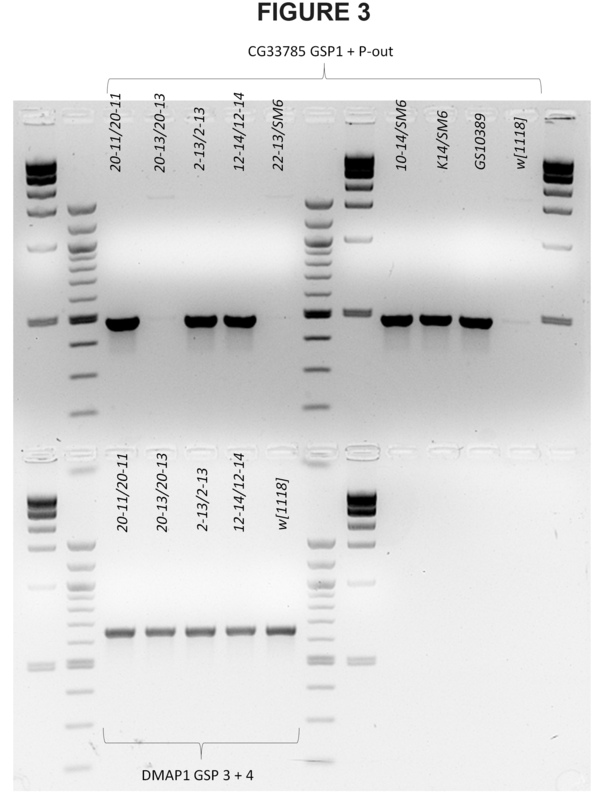 It looks good – fails to complement 10-14, which fails to complement a deficiency for the region, and it behaves just as 10-14 in the PCR assays as well. Now we know from the complementation tests that of the lethals, 22-13 and K-14 complement deficiencies for DMAP1 obtained from the Bloomington stock center. So these are lethal hits elsewhere in the genome, and therefore should be chucked (which is hard because Drosophila geneticists tend to be hoarders of genotypes). Of the viables, 20-11 shows a weak failure to complement with 10-14 so I am inclined to keep it, in case it turns out to be a hypomorph (partial loss of function). Though, like the other viables, it shows this bizarre P element there-and-not-there molecular phenotype. BUT: there is an outside chance that these viables might in fact be duplications for the region, which, if you examine the original paper (PMID: 8978050) indicates that duplications can occur with approximately equal frequency to the deletions. We might be able to detect these by PCR – a forward primer pointing downstream in DMAP1 and a reverse primer upstream of the forward primer might amplify a product, if a local duplication as occured. Worth a try. We have no idea about the gene structure for DMAP1 in the lethals. These stocks are balanced, and so primer pairs NOT involving P-OUT will amplify from the wild type sequence present on the balancer. I need homozygotes for whatever the lesion is in 10-14 (or K8-15) in order to test for gene structure using solely gene specific primers. I tried rebalancing the lethal 10-14 over a CyO-GFP balancer and looking for GFP-minus larvae but saw none, suggesting this genoytpe has a very early lethal phase (dying as an embryo perhaps, or a first larval instar, where the GFP doesn’t show up). So plan B: note from the complementation tests that 10-14 complements the original P strain GS10389. If I can purify DNA from flies transheterozygous for the P element-bearing chromosome, and the 10-14 deletion chromosome (or K8-15 for that matter), I might have a chance at mapping the gene structure, using primers that span the insertion site. For the GS10389 chromosome, the region is too large for conventional PCR (the engineered P element insertion is about 7000+ base pairs of DNA – conventional PCR is good to about 3000 bp), and so if I find a primer pair that anneal to the remaining DNA, I should be able to amplify a product. If that happens, I will certainly cut out the amplified band from the gel, extract the DNA and clone the fragment, and stick it into my freezer until I can find some $$$$ to sequence it. At that point, we will know the precise molecular nature of the lesion. Hurrah!